The Caucasus is home to many endangered species. But probably, the most beautiful, symbolic and threatened species is the Caucasian Leopard. Today, its protection is one of the hardest environmental challenges not only in Armenia, but also for the entire region. The species is listed in IUCN Red List of Threatened Species and the Red Book of Armenia. The effective implementation of Caucasian leopard conservation is interrelated with the monitoring of the leopard and its prey species in the wild. The main goal of the monitoring conducted by WWF-Armenia is to identify the dynamics and distribution of the target species: the Caucasian leopard, Bezoar goat and Armenian mouflon in Southern Armenia. In addition, the monitoring system provides information on other mammals such as bears, lynx, wild boar, etc. Monitoring is carried out using camera traps that are installed on paths that are regularly used by the target animals. The camera photographs the animal as it moves past the trap. What’s more, the wildlife specialists of the WWF and partner organizations’ implement periodic field visits for monitoring Bezoar goats and Armenian mouflons, recording traces and collecting scats in order to conduct DNA analysis. In the monitoring process, the members of the newly created Leopard Caretakers’ Network, rangers of the protected areas, and others are actively involved. WWF-Armenia emphasizes the importance of promoting young generations’ love of nature. WWF carried out numerous activities in schools across Yerevan and in many rural areas, such as organization of eco-camps, special classes, presentations and educational expeditions. We aim to involve young generations throughout the Yerevan, Ararat, Syunik and Vayots Dzor regions in the protection of the Caucasian Leopard. Educational events aim to present to the public the importance of the leopard for the wildlife of Armenia, as well as the main factors that cause the species to become endangered. These efforts involve our cooperation and coordination of efforts with educational institutions, private sector corporations and international organizations. Within the frame of these activities, exhibitions in public areas and various photo contests were organized to raise public awareness. The conservation of the Caucasian leopard and its habitats is being implemented through the establishment of protected areas and the enhancement of their capacities. In the last decade, with the joint efforts of WWF-Armenia and the Ministry of Nature Protection of the Republic of Armenia, new protected areas, such as Arevik National Park, Khustup and Zangezur sanctuaries, as well as the first community-based conservation area in the Caucasus - Gnishik, have been created in Southern Armenia, which encompass leopard habitats or its migration corridors. The total area of the newly created protected territories is more than 73,000 hectares. WWF-Armenia is also seeking to organise various trainings and workshops for the personnel managing the protected areas of the protected areas. The Caucasian or Persian Leopard (Pantera pardus tulliana) dwells in Armenia in the three southern provinces of the republic: Ararat, Vayots Dzor and Syunik. In the past, according to literary data, it was also observed in the north of the country. This leopard is a very versatile species, and in Armenia it inhabits areas from the subalpine meadows to the galleys (riparian thickets) of the Araks River valley. The best habitat for leopards are the juniper sparse forests with rocky outcrops, deep gorges, heavily dissected slopes and stone talus. The body length can reach 126-183 cm, the tail length 94-116 cm. The weight of adult males can sometimes reach up to 90 kg. Females usually weigh less than the males and their body length is shorter. Leopards are very flexible in their choice of inland areas, and the territory of the dominant, adult male can reach up to 15-30 thousand hectares. The habitat of an adult female with kittens can also reach a size of more than 10 thousand hectares. In the presence of many scrapes, so-called clusters, we can judge the state of the population and its viability. These goats get their name from bezoars – the indigestible mass found in their stomachs. The males have distinctive, enormous horns. Bezoar goats are listed as vulnerable in the Red Book of Armenia and are included on the IUCN Red List. According to the monitoring by WWF-Armenia, there are about 3000 Bezoar goats living in Armenia. The Armenian mouflon is a type of wild sheep which can be found in the Armenian highlands. The preferred habitat of the mouflon is the dry steppe. They are listed in the Red Book of Armenia and in the IUCN Red List. According to the monitoring by WWF-Armenia there are about 300-400 mouflons in Armenia. Roe deer is a quick and elegant animal usually found in forests and woodlands. Only the males have the majestic horns. The roe deer can also be found in Europe and Asia. The wild boar is the ancestor of the domesticated pig. It weighs around 100-150kg and the length of the body is approximately 170cm. The boar is omnivorous and mainly lives in mixed broadleaf forests. They are social animals led by a matriarch. The badger can be distinguished by its black and white striped head, grey fur and short legs. They live in excavated tunnels and burrows called setts. The animal is widespread in Armenia. During field studies badger remains were found in leopard scats. Today, information technologies are an inseparable part of our lives and can also serve to raise awareness on threatened species and other nature conservation issues. Now, it is possible to enliven the Caucasian leopard and take a photo with him. You get a three-dimensional animated picture of the leopard by scanning the marker through ARLOOPA app. The initiative was jointly implemented with ARLOOPA (X-TECH) company. Our Leopard Caretaker Network consists of enthusiastic volunteers from local communities. Since 2016, WWF-Armenia has established a network of leopard caretakers, which is an innovative approach to nature conservation and is aimed to promote community involvement in the monitoring and conservation of the Caucasian leopard and its prey species. Currently, we have groups of leopard caretakers operating in a number of communities in Vayots Dzor and Syunik provinces. Caretaker groups make regular visits to adjacent areas of the community and perform field research and observations, installing cameras and carrying out other activities. The Caucasus is home to many endangered species, but probably, the most beautiful, symbolic and threatened species is the Caucasian Leopard. Today, its protection is one of the hardest environmental challenges not only in Armenia, but also for the entire ecoregion. The species is listed in the IUCN Red List of Threatened Species and the Red Book of Armenia. There were almost no signs of leopard presence in Armenia in 2000. Poachers’ greed had even reached the mountain heights – the habitats of this extremely careful animal. However, since 2006, leopards were again spotted in Armenia and currently only 7 leopards are recorded by the WWF. Leopard is one of the symbols of Armenia and its national power; it shows up in ancient stone carvings, stories and paintings. It symbolizes wisdom and the ability to survive in very difficult circumstances. For survival and reproduction this species needs safe habitats and long distances for free movement. For many years WWF continuously has been working toward ensuring the above needs and improving living conditions of these beautiful big cats. In 2017 WWF is celebrating 15 years of Leopard Conservation in Armenia. Besides the strengthening the existing habitats of leopard, Khosrov Forest and Shikahogh State Reserves, WWF in cooperation with the Ministry of Nature Protection of Armenia started activities aimed at establishment of new protected areas in the south of Armenia. In 2010, new specially protected nature areas were established – Arevik National Park, Khustup and Zangezur Sanctuary. That’s right, this young leopard’s journey was a long and dangerous one, his story is quite shocking! It is highly likely that Leo/Neo is the same leopard which was first sighted and photographed in Nakhijevan when he was just a little cub. “If our calculations are correct, then he was most likely born in the Zangezur Mountains, in July 2016,” said Malkhasyan; that would make this beautiful creature about 3 years old. WWF-Armenia, Ayb School and Gnishik Protected Landscape are launching the “Junior Ranger Program” initiative, which is being implemented in Armenia for the first time. The goal of the initiative is to promote ecological education in protected areas and involve schoolchildren in environmental activities. The duration of the pilot project will be 6 months. The “Junior Ranger Program” was established in 2002 by the European Conservation Area Federation (EUROPARC). It currently unites more than 5,000 teenagers from almost all over the Europe, as well as 80 protected areas in 19 EU countries. In case of success of the “Junior Ranger Pilot Program” in Armenia, this eco-education model can also be introduced in other specially protected nature areas as an environmental education tool, which is particularly important for attracting teenagers from adjacent communities to nature conservation. Within the Leopard Conservation Project, WWF-Armenia initiated a discussion on the introduction of the 24-hour pilot protection system in the “Arevik” National Park with participation of the Ministry of Nature Protection, Zangezur Biosphere Complex, Caucasus Nature Fund and Support Program for Protected Areas representatives. During the meeting, it has been discussed the introduction of protection system, which will carry out 24-hour patrolling on the territory of the national park or throughout the whole Zangezur Biosphere Complex through day and night time visits. It is anticipated that each patrolling group will cover 7000-10000 hectares according to the defined routes. The routes will be designed by specialists based on geographical location of the area, the passage of roads, and the poaching frequency. The representative of the Support Program for Protected Areas (SPPA), who participated in the discussion, said that within the SPPA project they are ready to provide the necessary equipment for the groups. The Caucasus Nature Fund can provide with the required fuel, as well as bonuses to the staff for the successful implementation of the project. At the end of the meeting, in the framework of the WWF-Armenia’s Leopard conservation project, as a the first step the field equipment were given to the “Zangezur” Biosphere Complex SNCO, which manages the “Arevik” National Park, including binoculars, GPS, photo camera, sleeping bags, tents and so on. From now on, employees of Arevik National Park, which is part of the Zangezur Biosphere Complex, will have an opportunity to control even the most remote areas of the national park with online video cameras. This will significantly contribute to the effective preservation of the national park and poaching level decrease. This has become possible thanks to the installation of 4 online cameras which will be powered by solar energy for the first time. This is a pilot project and, in case of positive result, it will have its continuation and will be adopted in other protected areas of Armenia. The initiative was implemented within the framework of WWF-Armenia’s Leopard Conservation project and HSBC Bank Armenia’s “Let’s protect Threatened Species in Armenia” project. This year, it’s already second time that WWF-Armenia is placing solar panels in national parks. First was in Dilijan National Park and this time is in the Arevik National Park. The use of modern technology will increase the efficiency of work, and most importantly, will contribute to the process of developing Green Armenia. 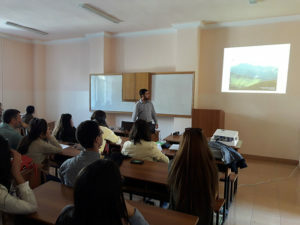 WWF-Armenia continues its series of seminars and workshops in educational institutions as well as presentations for the students within Leopard conservation project. On November 14th, staff of the WWF-Armenia made a presentation for schoolchildren in Yerevan basic school N145 after Silva Kaputikyan. The main topics of discussion were Caucasian Leopard and its prey species, their conservation activities, research and monitoring. The highlight of the meeting was presentation of unique video and photo materials of Armenian fauna. On November 25th, Leopard Conservation Project’s coordinator Dr. Arsen Gasparyan made presentation at the Yerevan State University, Faculty of Journalism on conservation of threatened species and main nature conservation issues. These series of presentations aim to raise awareness of schoolchildren and students on importance of biodiversity, our wildlife, climate change impacts and other ecological problems, also to motivate schoolchildren and students for biodiversity conservation. On November 30th, the educational workshop for beginners in the statistical programming language R was realized at the WWF-Armenia within cooperation with Zoology Department of the Yerevan State University. This software becomes more and more popular in all the academic fields and scientific research. The staff members of the WWF, staff and students of the Zoology Department of the YSU participated in the workshop. The participants learned about the advantages of this open-access software and how to do first data analysis, manipulations and visualizations. The workshop was conducted by Judith Rakowski, who is a Master student of the Geography Department at the Humboldt-University of Berlin and is doing an internship at the WWF-Armenia office. Seven road blocks and fifteen signboards have been installed by WWF-Armenia in the Arevik National Park with financial support of HSBC Bank Armenia and WWF-Armenia’s “Leopard Conservation Project”. The initiative was implemented in the frames of “Let’s protect Threatened Species in Armenia” project, which aims to strengthen protected areas and ensure better protection and monitoring for target species such as Caucasian Leopard, Bezoar Goat, Armenian Mouflon in the Arevik National Park. This activity supports the protection of habitats for the species, facilitate prevention of poaching and raise public awareness on nature conservation. The seven installed road blocks will prevent the access of poachers and other unauthorized vehicles to the National Park. Thereby, poaching and the level of disturbances will be reduced. The newly installed signboards provide information about the Arevik National Park, give necessary notice for wildfire prevention in the area, etc. WWF-Armenia is very thankful to the staff of the “Arevik National Park” branch of the Zangezur Biosphere Complex for their support in installation of the signboards and roadblocks. HSBC Bank Armenia is one of the best partner organizations of WWF-Armenia supporting the projects dedicated to the wildlife conservation. On October 22, WWF-Armenia and HSBC Bank Armenia staff did volunteer work in the Caucasian Red Deer Breeding Center. In particular, the whole area of ​​the Breeding center was cleaned, warning signs were placed, the fence was repaired, and the improvement works were carried out. This initiative was implemented within the frames of “Let’s protect Armenia’s Endangered Species” project, which aims to strengthen protected areas and ensure better protection and monitoring for them. During the event, Arsen Gasparyan and Arthur Alaverdyan, WWF-Armenia project coordinators, presented Caucasian Leopard Conservation and Caucasian Red Deer Reintroduction programs in Armenia, as well as the main environmental concerns in the country and the measure to address them. HSBC Bank Armenia is one of the best partner organizations of WWF-Armenia supporting the projects aimed at the protection of wildlife. On November 1-2, 2017 40 schoolchildren from Yerevan, Vayots Dzor and Syunik regions participated in the eco-camp organised by WWF-Armenia and the United Nations Office in Armenia in Vayots Dzor. This camp was the final stage of the “Me and My Corner of Nature” environmental initiative, launched earlier in spring. The camp participants were the authors of the best works of «Me and My Corner of Nature” photo contest as well as a number of other schoolchildren from the above mentioned regions. The representatives of the UN Armenia Office presented 17 Sustainable Development Goals through various games, videos and presentations. The Goals were adopted by world leaders at an historic UN Summit in September, 2015. 17 goals are aimed at eliminating poverty in all its forms, addressing a range of social needs and climate change issues. 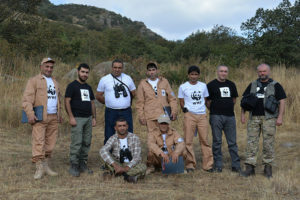 Then representatives of WWF-Armenia presented Caucasian Leopard Conservation Project, as well as modern field survey techniques, during which participants had the opportunity to see one of the main methods of wildlife observation – photo and camera traps. They learned the principles of their installation and operation. The participants could also see the Bezoar goats in wildlife. The camp was filled with interactive games, competitions, songs and dances. The Environmental protection and Mining Inspection body of Armenia and the WWF – Armenia signed a memorandum of understanding on 19th of October. Within the framework of this Memorandum, WWF-Armenia undertakes to assist the inspection body by providing the necessary equipment and fuel, to organize trainings and exercises that will increase the capacities and skills of the staff of Vayots Dzor and Syunik province branches of the Inspectorate; as well as to assist in the activities of the Inspectorate for the protection of the Caucasian leopard, Bezoar goat, Armenian mouflon and other endangered species. 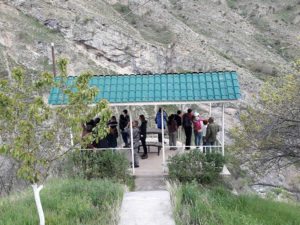 The Environmental protection and Mining Inspection body of Armenia in its turn undertakes to conduct tours on regularly basis to the habitats of the above listed species and to provide WWF-Armenia with information on violations recorded during the tour. On July 10, 2017, the results of the contest “Take a picture with the Leopard”, implemented in the framework of the Environmental Information Campaign, were summed up. The contest was organized by WWF-Armenia. The winners were selected by the jury. More than hundred photographs, which contained important and interesting information on the Caucasian Leopard, have participated in the competition. According to the results of the competition, the winner became Lusine Stepanyan, who was awarded the main prize, a mountain bike. David Hayrapetyan and Manana Hovakimyan took second and third places. The jury also highlighted the most creative participant, Argishti Mkrtchyan, who decided to play chess with a virtual leopard. 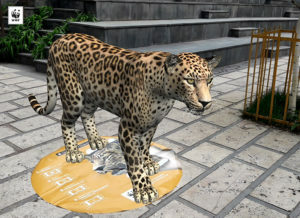 The participants were able to get a three-dimensional animated picture of the leopard by scanning the marker with the picture of it through ARLOOPA app. The initiative was jointly implemented with ARLOOPA (X-Tech). On July 28th, staff members of the WWF-Armenia visited Gugark summer camp. We made a presentation about the Caucasian Leopard, its prey species and habitat, showed footage and photos of Armenian wildlife. The participants also photographed with virtual leopard via ARLOOPA app. 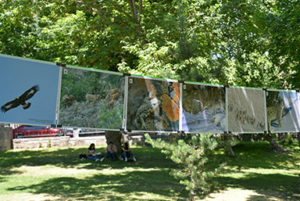 On June 5, on the occasion of the World Environment Day, the photo exhibition “Me and My Corner of Nature” initiated by WWF Armenia and UN Armenia was opened in Lovers’ Park, Yerevan. The exhibition includes photos sent by schoolchildren from different regions of Armenia within the educational campaign “Me and my corner of nature”. Children are depicted in the photos in their favorite corners of nature. Photos by WWF Armenia’s environmental specialist Alexander Malkhasyan depicting some endangered species that are included in the Red book of Armenia are also exhibited. On June 7-14, the photos will be exhibited in UN House Armenia. The main purpose of the educational campaign “Me and my corner of nature” is to raise awareness among children about environmental goals of sustainable development as well as about a number of endangered species in Armenia among which are the Caucasian leopard, Bezoar goat and Armenian mouflon. The authors of the best three photos will receive symbolic gifts, and certificates will be granted to all participants. In the second phase of the campaign the selected participants are expected to present their proposals addressing an environmental issue in their respective communities. The authors of the best proposals will participate in an environmental field camp in autumn. 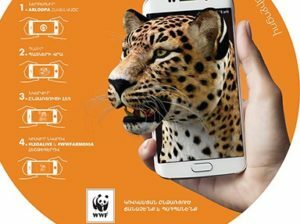 Starting from May 16, WWF Armenia launches “Take a Photo with the Leopard” environmental information campaign. Within the campaign’s framework, it will be possible to enliven Caucasian leopard with ARLOOPA application and take a photo with him. The initiative is being supported by X-Tech IT Company, which joined WWF- Armenia’s “Leopard caretakers” network. Special ground marker and banner will be placed in different educational and public places (Yerevan State University, YSU’s Ijevan Branch, UWC Dilijan College, Yerevan Lovers Park, Dalma Garden Mall, Green Been, DoubleTree By Hilton Yerevan City Center hotel, Yerevan Botanical Garden, Tumo Park), which will allow people to get leopard’s animated three-dimensional image by their smart devices (using ARLOOPA app). The app also allows you to take photos with the leopard, hear its voice, etc. As a part of the campaign, online photo contest is announced till June 16, 2017. People should place a photo with the animated leopard on their Facebook page, along with an interesting fact about the leopard. The posts should have #WWFArmenia and #LeoAlive hashtags. The juries will choose a winner of the best photo and the most interesting fact. The winner will get a grand prize – mountain bike. From May 5 to May 6, 2017 the Eco-Camp was organized for students of the UWC Dilijan School in the Gnishik Protected Landscape. 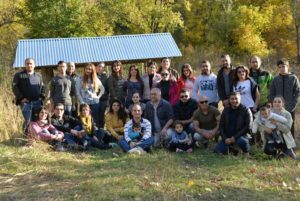 The aim of the event was to conduct environmental seminar and to organize a field visit to raise the awareness on Leopard Conservation project in Armenia. 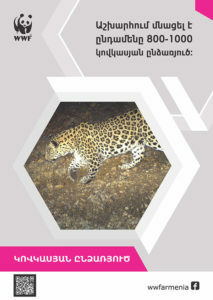 The environmental event was organized within the framework of «In the Wake of the Leopard» campaign initiated by WWF-Armenia. About 20 participants from different countries, who are the students of the college, joint the camp. The camp started from the WWF-Armenia office where students had chance to get acquainted with WWF staff and their projects in Armenia. Next stop was Gnishik Protected Landscape’s visitor center in Vayots Dzor where they met Arus Nersisyan, director of the Gnishik Intercommunity Environmental Foundation. After the small presentation the group moved to Noravank Monastery, a 13th-century Armenian monastery, located in a narrow gorge of Noravank, near the town of Yeghegnadzor, Armenia. Later the group visited Areni-1 cave, a 6100-year-old winery that was discovered in the village of Areni in the Vayots Dzor region. The oldest shoe of the world was found in the same cave in 2008. Last stop of the day was Bezoar goats observation point in Shatin village of Vayots Dzor region, where students could see several groups of bezoar goats in the wildlife. The observation point was created by WWF-Armenia to promote community-based ecotourism in the area. Second day’s agenda included field visit and hiking to the Gnishik Protected Landscape where participants observed wildlife and incredible landscapes of Noravank Gorge. WWF-Armenia’s wildlife expert Mr. Alexander Malkhasyan presented wildlife monitoring methods of WWF and demonstrated camera traps installation. Arsen Gasparyan, Leopard Conservation project national coordinator presented WWF’s efforts towards the threatened animal species conservation. The students were introduced results of animals’ bioactivity, such as footprints and food remains. The camp was full of information, positive emotions and good memories. It’s just a beginning of very productive cooperation between UWC Dilijan College and WWF-Armenia. Last week Ayb School hosted WWF-Armenia representatives. 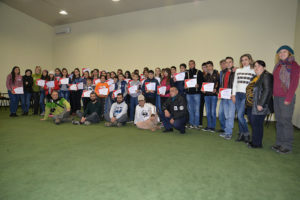 The meetings, which were organized for two different age groups, were held within the framework of the “Leopard Conservation” project, implemented by WWF in Armenia for already 15 years. During the meetings, the coordinator of WWF- Armenia “Leopard Conservation” project Arsen Gasparyan told about the leopard, presenting its main habitats, endangering factors, project achievements, prey species, etc. During the meeting, students had the opportunity to watch video and photo materials of camera traps which were presenting Armenian wildlife. The students were very interested and active which made the atmosphere very interactive and meaningful. Competitions on different environmental topics were announced during the meetings, within which students will present paintings, photos, essays and other works. These meetings aim to raise the level of public awareness on the importance of the wildlife and environmental issues, as well as create a sense of responsibility towards the nature conservation. From March 3, 2017 the WWF-Armenia, with the support of the Karen Demirchyan Yerevan Metro CJSC, presents “Caucasian Leopard – the King of Armenian Mountains” exhibition in “Yeritasardakan” Station of Metro. The exhibition is organized within the framework of 15-year anniversary of Caucasian Leopard conservation project in Armenia, which is being implemented by the World Wide Fund for Nature’s Armenian branch – WWF-Armenia. Since 2002, the WWF has been implementing a conservation project on this species in Armenia, thanks to which the animal has not only returned to Armenia but also registered a positive trend. The photos, which are on display, present the main natural habitats of the Caucasian leopard, the prey species (Bezoar goat, Armenian mouflon, Roe deer, etc. ), as well as some conservation measures. March 3 is not a random day. It’s a World Wildlife Day, which aims to raise awareness on the conservation of the world’s threatened wild animals and plants. This year’s slogan is “Listen to the young voices” which encourages the young leaders and future decision-makers to protect endangered wildlife of our planet. On December 1, WWF-Armenia visited Dilijan Central School, which belongs to the Ayb family schools. The aim of the visit was to introduce the Armenian nature, endangered species, and the main measures of their protection, forests and their importance to the children. During the meeting, Mr. Arsen Gasparyan, the coordinator of WWF- Armenia “Leopard Conservation” project in Armenia, presented the latest shots and footages of photo-traps. Children liked this very much and were very excited. Mr. Artur Alaverdyan, coordinator of the forest projects of WWF-Armenia, presented the current state of Armenia’s forests and possible dynamics. The topic was so interesting that children started an active discussion with the presenter about the ways of saving forests and their importance. While children were having classes, WWF- staff visited the school and got acquainted with the school’s unique teaching methodology which ensures the development of children. The existence of such a school in Dilijan is not only significant from the educational point of view but also extremely important for the overall development of the community. This series of meetings aimed at raising the level of public awareness on the importance of the forests, wildlife and environmental issues, as well as creating a sense of responsibility towards the nature conservation. WWF-Armenia continues its series of awareness raising presentations on Armenian biodiversity. This time Mr. Arsen Gasparyan, WWF-Armenia’s Leopard Conservation Project Coordinator, made 3 presentations for 3 different audience groups. First meeting was held on October 3, in the frames of World Animal Day celebration at Yerevan State University Zoology Department. The topic of the meeting was Leopard Conservation in the Southern Caucasus. 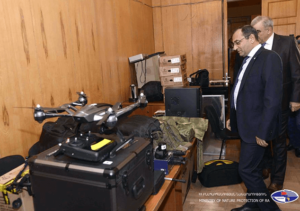 Mr. Gasparyan presented the main threats for the Leopard in the region, showed the last materials received by camera traps and told about the prey species of Leopard. Second meeting was held at the Armenian Society for the Protection of Birds’ Dsegh nature visitor center, on October 5. The main topic of discussion was Caucasian Leopard and its prey species which are all endangered species of Armenian fauna. Mr. Gasparyan presented the methods of their conservation and behavior research, protected areas of Armenia and their characteristics, as well as WWF- Armenia’s mission, goals, implemented projects and their importance for Armenia. Third presentation, held by Mr. Gasparyan on October 13, took place in Green Bean café, and the initiator of the meeting was “Birding Armenia” club. The hero of the discussion was again Caucasian Leopard, the king of Armenian biodiversity. Afterwards, Mr. Alexander Malkhasyan, zoologist and wildlife expert of WWF-Armenia, presented the monitoring methodology of endangered species in Armenia, as well as WWF’s approach towards their conservation. It is gratifying to note that all three presentations were full of people listening to the specialists attentively and asking questions with the great enthusiasm. WWF-Armenia will continue its awareness raising events which aim to present Armenian unique, rich and spectacular biodiversity. The Persian (Caucasus) Leopard (Panthera pardus saxicolor, Pocock, 1927 = P. p. cis-caucasica, Satunin, 1914) is a globally threatened subspecies classified as ‘Endangered’ by the IUCN. Once widespread throughout the Caucasus, the Persian leopard today is the rarest mammal in the region, holding out in a few small and isolated subpopulations, and the species is both red-listed in all Caucasus countries and recognised as a focal species for conservation for the entire Caucasus Ecoregion. Already for 15 years, WWF in partnership with IUCN/SSC Cat Specialist Group actively assists responsible Governmental Organisations in the conservation of this flagship animal. In this period, populations of the main prey species of the leopard, such as Bezoar Goat or Mouflon, have increased by at least 15%. 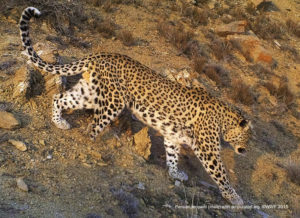 Leopard records have also increased, with more than 230 camera-trap photos and 30 videos of leopards have been obtained during last years in the Nakhchyvan Autonomous Republic and Tallish Mountains of Azerbaijan, as well as in southern Armenia, allowing for the identification of several territorial leopards. Despite these conservation successes, recent leopard records from camera traps point to a highly worrisome phenomena: since autumn 2015, our camera-traps have several times depicted two injured, foot-amputated leopard individuals, who – according to our records – were absolutely healthy before. The causes of these damages are still unclear. Given the extremely low number of Persian leopards in the region we clearly feel our responsibility and obligation to urgently call for deeper research and comprehensive assessments of leopard mutilations. An effective mitigation of this threat is becoming even much more important considering very recent and very good news passed by colleagues from Nakhchyvan, where the earlier identified female leopard was photographed with two well-advanced cubs. The same female with her two cubs was also observed in southern Armenia in December 2015. The discovery of young leopards in the Zangezur Mountains demonstrates that the protection of wildlife has improved in this region and that leopards can live and reproduce again. Thanks to the conservation efforts, the leopard has again a chance to survive and recover in the south-eastern Lesser Caucasus of Azerbaijan, Armenia and Iran. We will take new efforts to save the leopard in the Caucasus. The WWF Caucasus Programme (supported by WWF Switzerland and WWF Germany in partnership with Humboldt University Berlin) and the IUCN/SSC Cat Specialist Group (supported by the Foundation Segré) will together tackle the challenging issues that in situ and ex situ leopard conservation in the Caucasus currently is facing. These new opportunities – in combination with existing governmental will and effort – revives our motivation and confidence to continue and intensify work towards survival of the Caucasus leopard and other wildlife species in a long-term perspective. The scratches are left mostly by adult, dominate males; rarely adult females. More often they mark nearby trails, saddles, crests during the mating season, during estucca estrus. Scrapes of leopards, unlike traces, last longer on the ground. Scuffles on trees are less common, and to find them you need more experience, attention and knowledge of the terrain. It is extremely important to fix the traces of the leopard, taking into account the parameters of the track. The clearest, most reliable and least variable trace element is the impression of a large plantar cushion, or heel. Only the heel of the front paws is taken into account and measured; prints of hind paws are smaller in size, and more oblong. The width of the trace of adult males varies from 8.0-9.5 cm. An adult female has a trace, from 6,0-7,5 cm. A trace of kittens, varies from 5,5-6,5 cm. Notably, the tracks of the males are more spread out, the length of the heel is larger, and the overall size of the track is larger. The trace of an adult lynx corresponds roughly to the size of the leopard kitten’s track. What’s more, the scratch of the lynx has a greater surface-area and it is more fan-shaped, as opposed to the leopard which is both deeper and longer. Leopards in Armenia mate exclusively in Winter; usually from the end of December or the start of January until early February. Kittens are born in April; usually leopards have only two cubs, typically with a maximum of four. Female kittens are fully grown after only one year. The leopard is a cautious beast; his camouflage is magnificent. As such, to see the beast in the wild is extremely difficult; usually meeting with the leopard happens unexpectedly, and the cat does not flee in these cases, but rather retires with great dignity. The beast is magnificent, amazingly beautiful and powerful.